« I know there is a VSD . . . but I am not getting the gradient ! 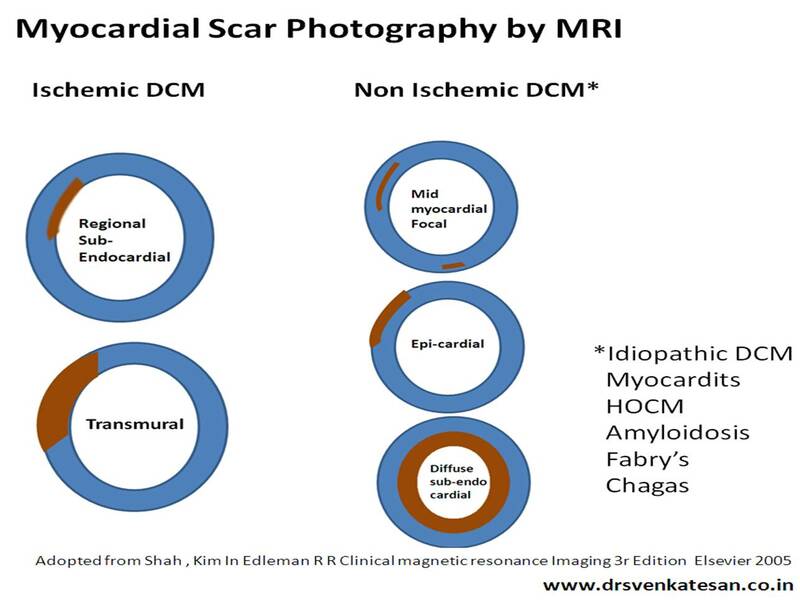 How to diagnose DCM with confidence by myocardial scar photography ? While many of us are preoccupied with wires and balloons ,( coronary myopia ! ) , our radiology colleagues are making rapid strides . Let us spend some time to understand how the myocardial segments are inflicted the final insult . We need to realize , there is a pattern to this myocardial end game of scarring and fibrosis. MRI is the gold standard to assess the myocardial architecture . It has a role in both assessing the anatomy , function , perfusion and viability . * Why do you require DEMRI to identify scar ? One can detect scars in plain MRI but contrasts make it better .Hence delayed enhancement in by DEMRI is used to detect scars. Following scar patterns in DEMRI help us to arrive a diagnosis. * Ischemic DCM will always involve subendocardium as ischemic wave front goes from sub-endo to epicardium. Why is scar localisation and Quantification important ? Apart from differentiating various cardiomyopathies it has few clinical implication . Since scar indicates irreversible damage , if extensive it will argue against any re-vascularisation . Scar location becomes vital if we plan CRT .It will be futile to place a CRT lead over a scar. Scars are often form a macro re-entrant circuits for VT .Help us localize or zeroing in VT focus. Scar quantification is helpful risk stratification of patients with HOCM .and their family. Myocardial scar location and quantification is the new mantra in a patient with dilated heart with cardiac failure. It may be more important than even a coronary angiogram .MRI will prevail over any of the available echocardiogram modalities to assess the scar pattern.